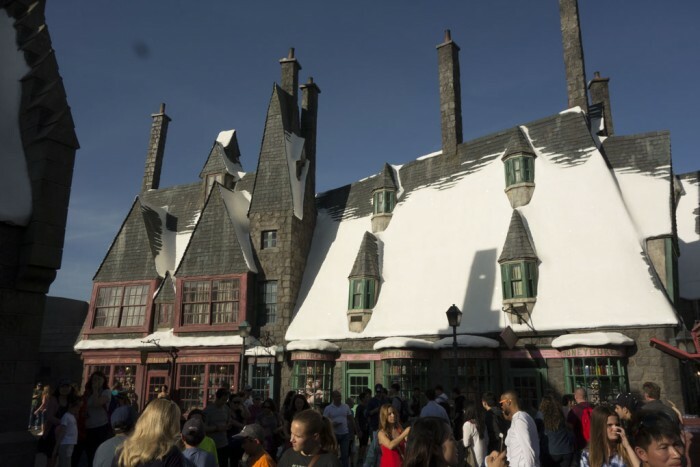 The Wizarding World of Harry Potter is a new land at Universal Studios Hollywood based on the Harry Potter series of books and films. 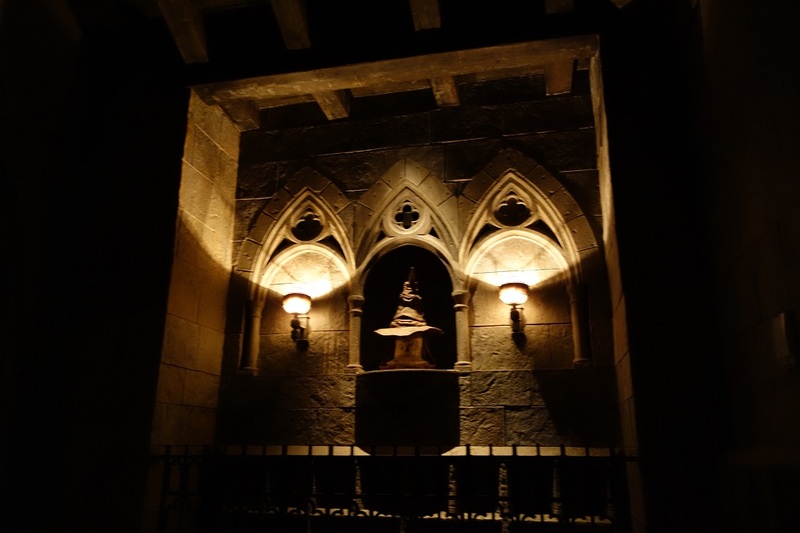 The land officially opens on April 7, 2016, but we were able to catch a technical rehearsal to the fully operational land. 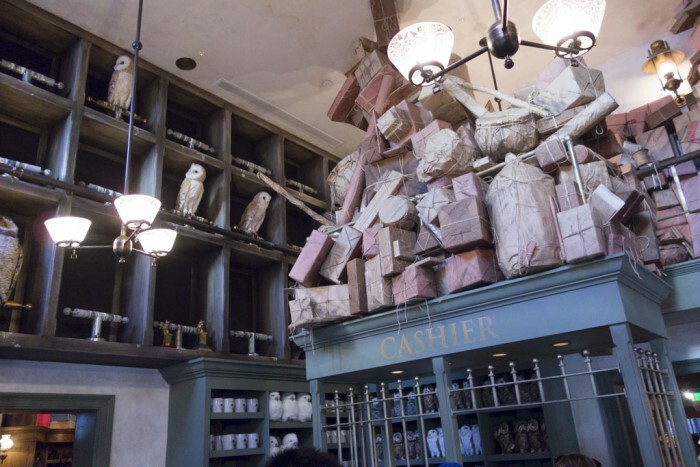 In this review I will cover all of the attractions, dining, and shopping in Wizarding World of Harry Potter. 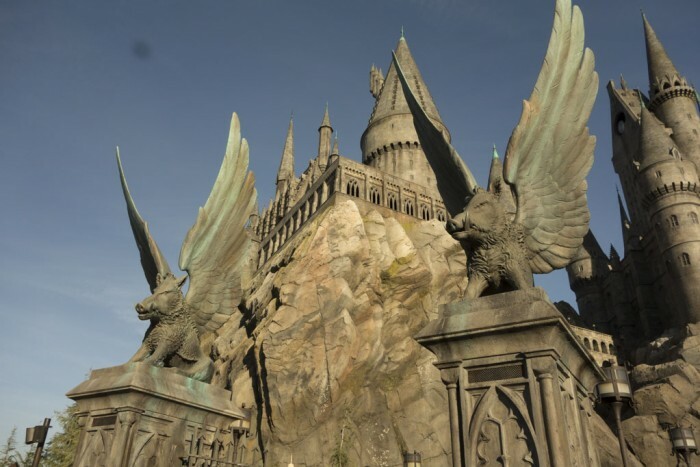 I will try my best to review the west coast version of this land as its own entity, but there will be certain things that must be compared to the version of the land in Islands of Adventure in Florida, and Universal Studios Japan in Osaka. 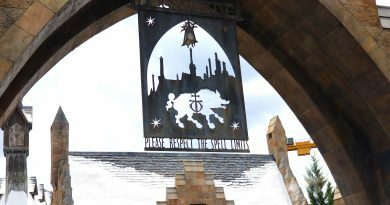 The Wizarding World of Harry Potter, or WWoHP as I’ll call it for the rest of this post, is located on the Upper Lot, directly across from Animal Actors stage. 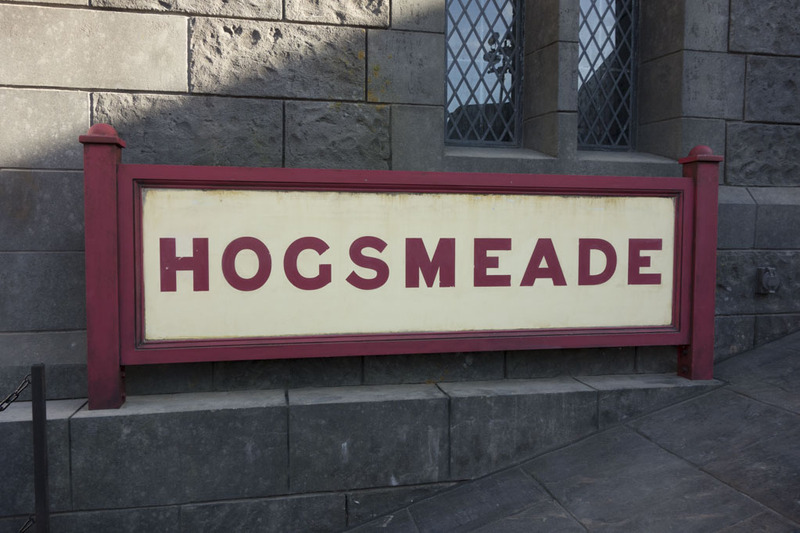 It’s a short walk from the main entrance of the park, which is nice as that’s probably where most Universal Studios guests will start their day from now until the end of time. 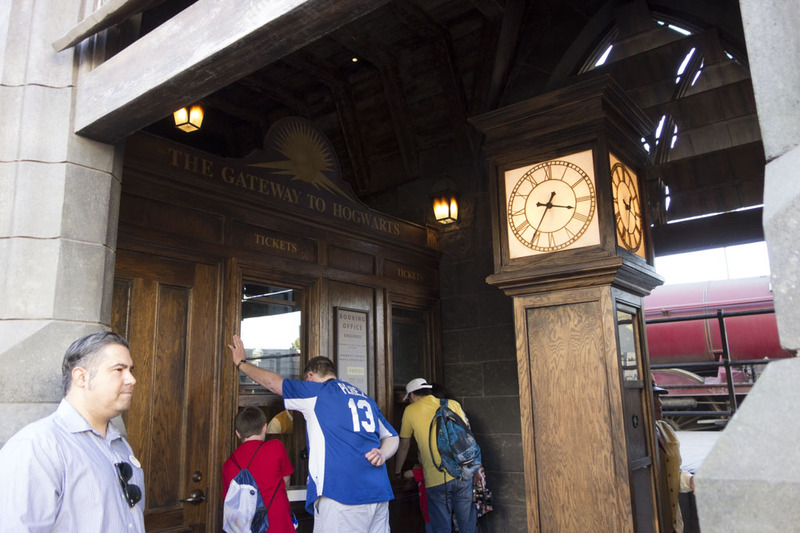 Luckily WWoHP is pretty much a straight shot from the entrance of the park, which makes it easy to find in a park that some people find hard to navigate due to having no central hub (unlike most Disney theme parks). 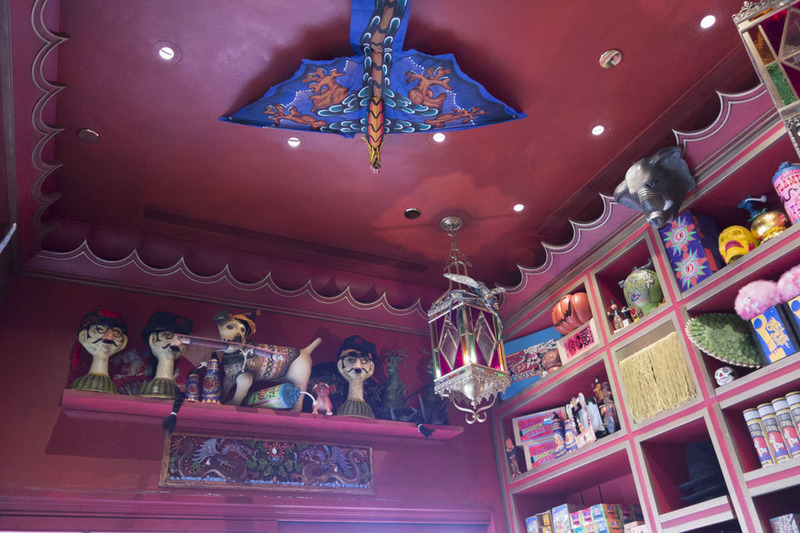 It’s also worth noting Universal’s Upper Lot is mishmash of themes and architectural styles: one stretch is 1920’s Los Angeles, the next is Paris, and then all of a sudden you’re in Springfield from the Simpsons. 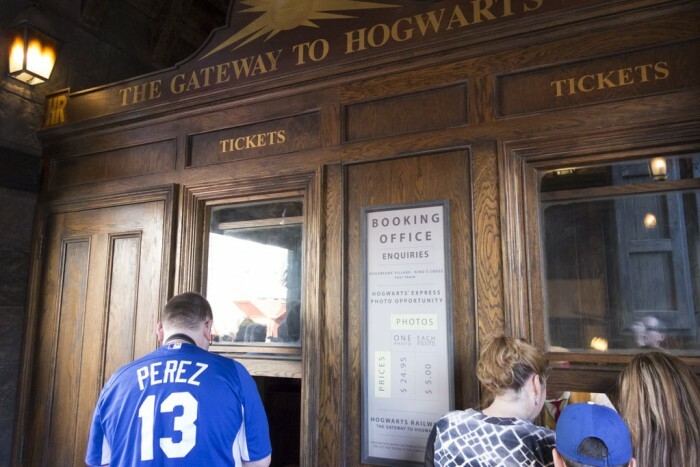 If you expected Universal to change this with the opening of WWoHP, they did not. Hogsmeade Village at Universal Studios Hollywood with Hogwarts in the background. After entering WWoHP you get a great view down the main thoroughfare the land, including it’s snow-covered roofs and windows filled with trinkets. Hogwarts castle towers over the rest of the land and it does a good job at grabbing your attention and making you want to enter and explore. 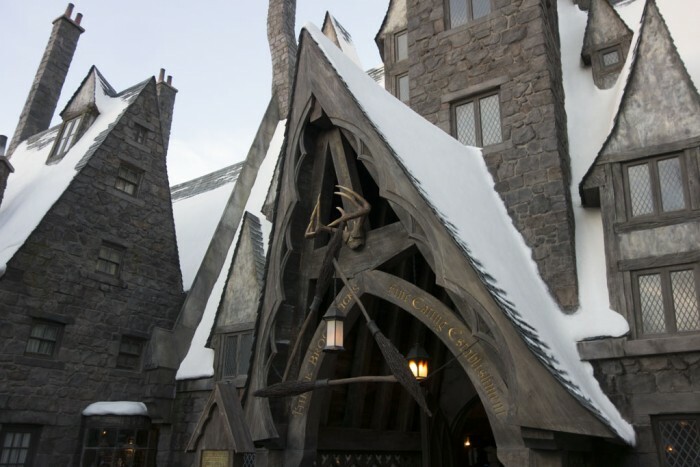 WWoHP is not a full on recreation of Hogsmeade as it appears in the films, but an amalgamation of landmarks, creatures, and themes from the films and books. 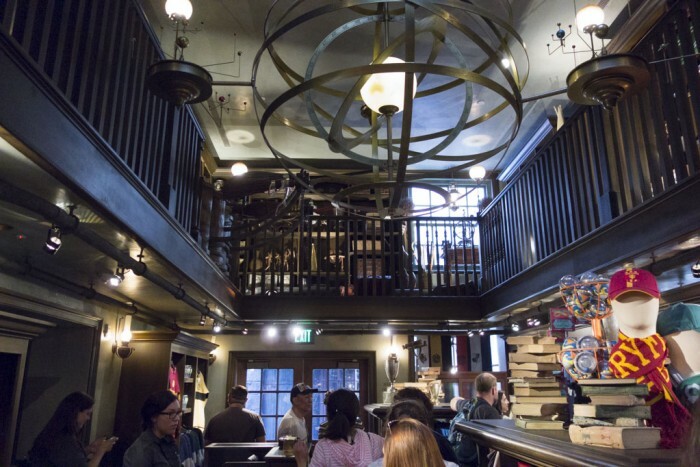 Potter fans will be in heaven as they pore over the hundreds of little details in and outside of the buildings. But if you’re like me and have never seen any of the movies or read any of the books, the land is still extremely enjoyable. It’s simply a nice place to look at and be in, which I think we can all agree is the bare minimum of what a theme park should be. 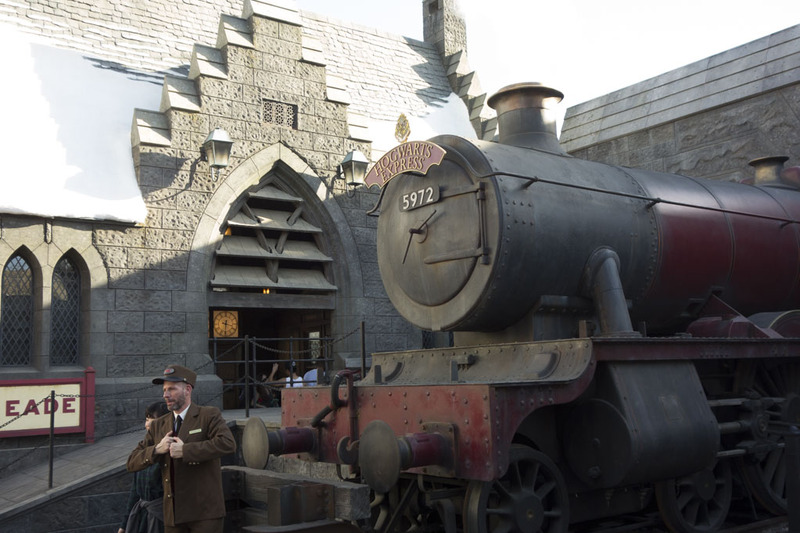 Immediately on the right after you enter WWoHP is Hogwarts Express, parked and ready for a photo op. A conductor is on hand to be in your picture. 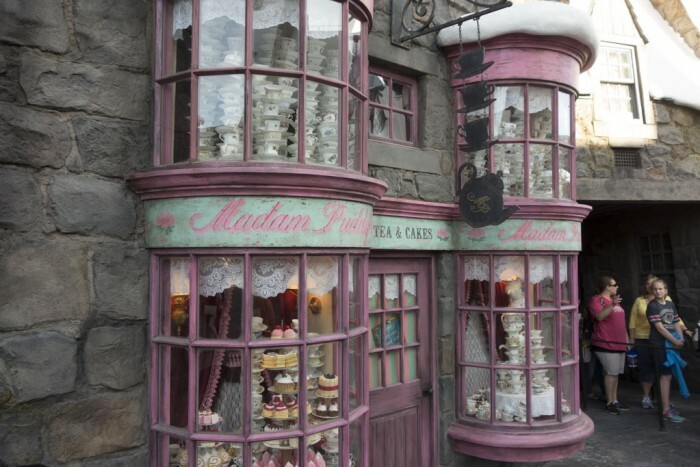 slate roofs; bowed multipaned windows; gables; and tall, crooked chimneys. as reminiscent of Sherlock Holmes as it is of Harry Potter. 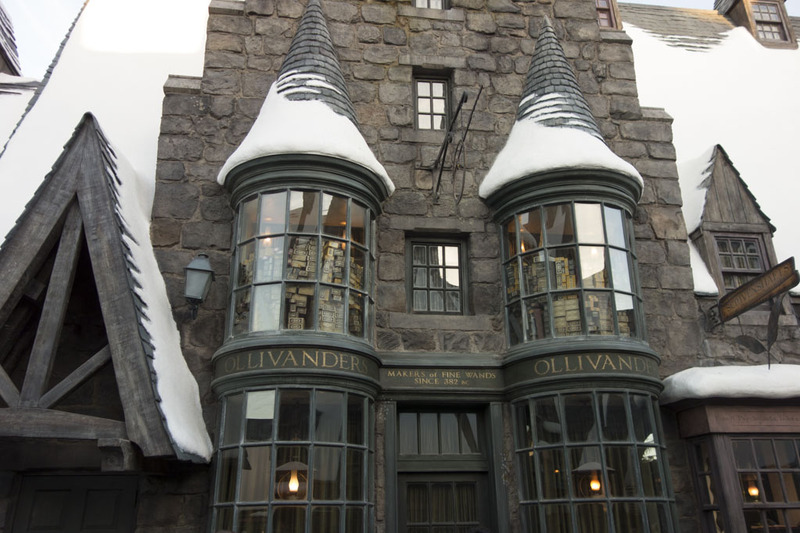 The building exteriors look exceptional, and the best parts about them are the windows. 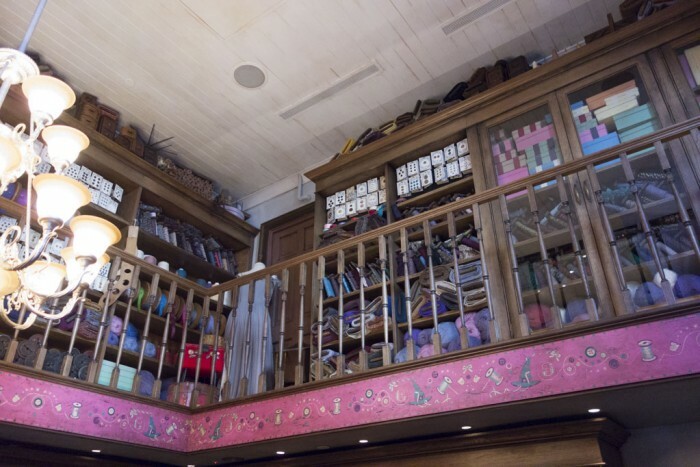 One could easily spend hours looking in each window as they try and discover every one of the various knickknacks and gadgets that are placed inside them. 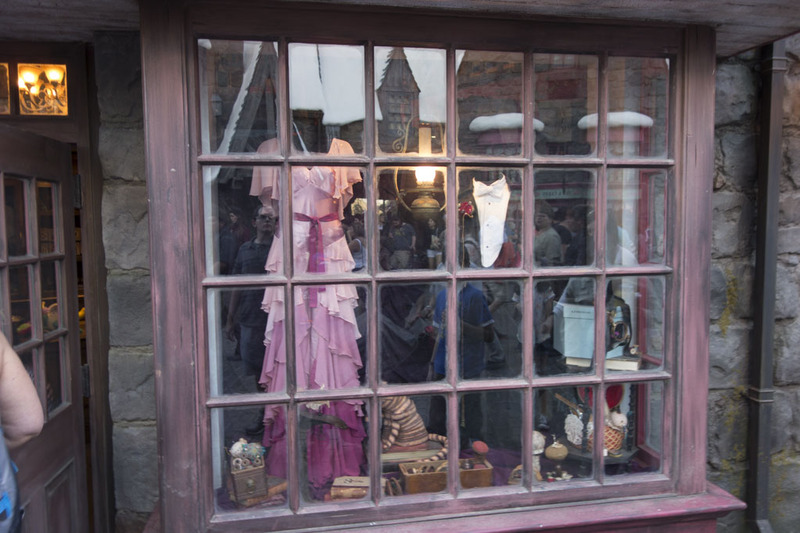 A closer look at just a few of the items found in the windows around WWoHP. 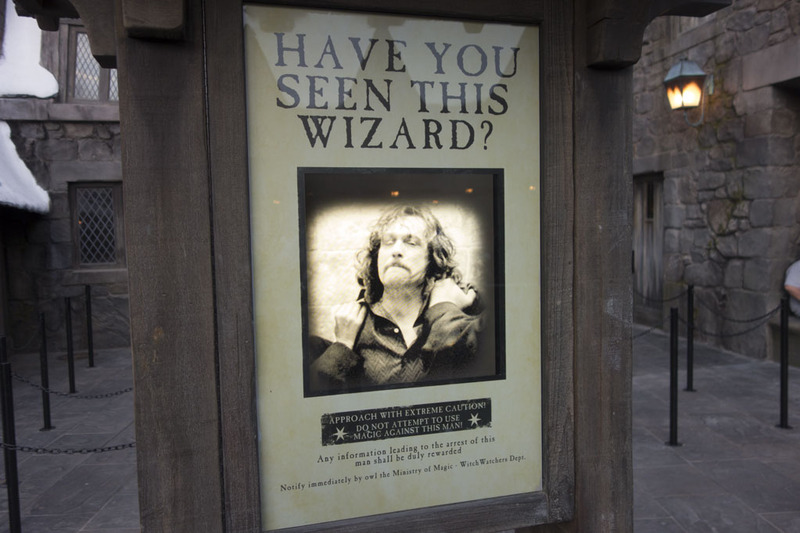 Several of the windows, as well as this wanted poster, feature interactive elements that can be triggered with special wands that can be purchased for about $40. 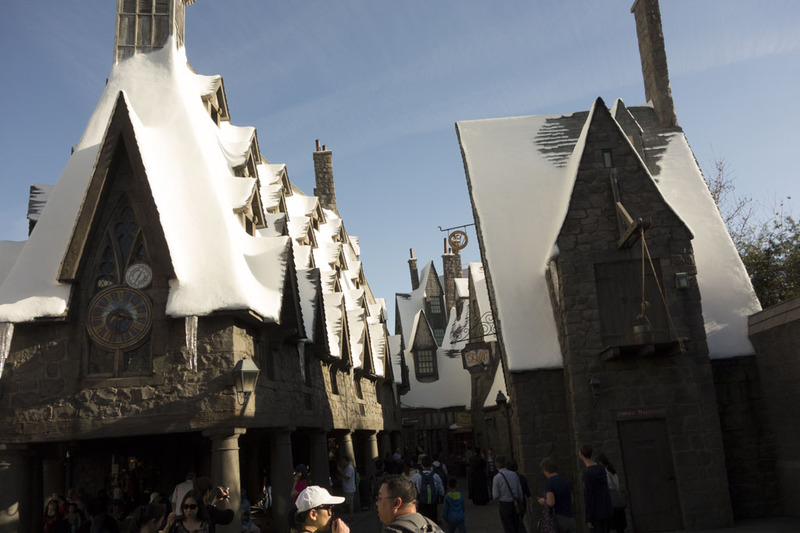 Looking back at Hogsmeade as you approach Hogwarts. The Frog Choir performs on a small stage near the edge of Hogsmeade. Each show lasts about 10 minutes. 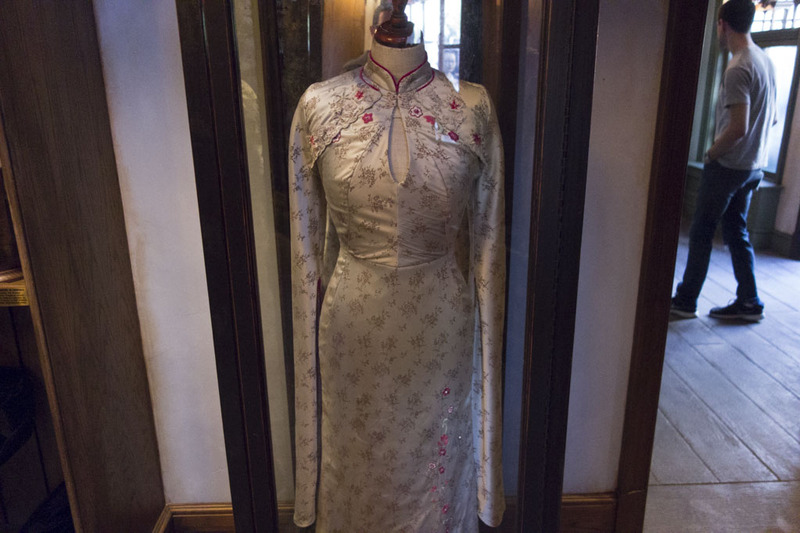 They are also available for a photo op after each show. 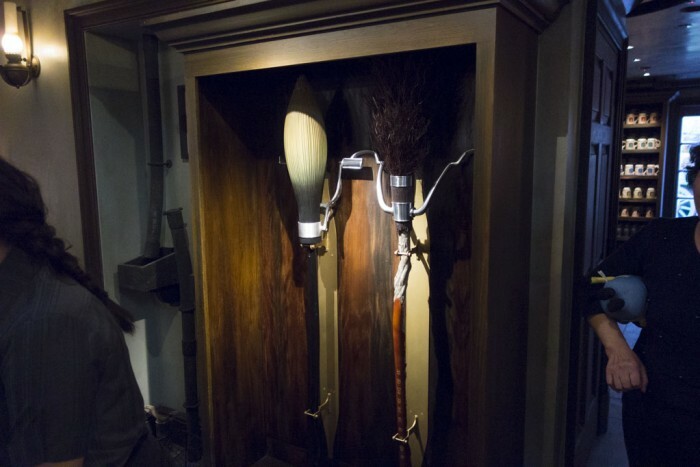 placed mandrakes to amuse you. 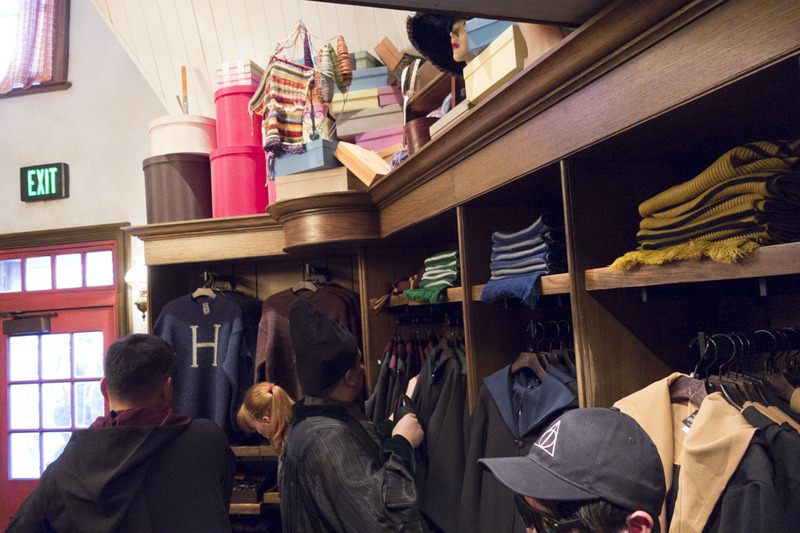 You can find a replica of the Ford Anglia Ron and Harry flew to Hogwarts in the Forbidden Journey queue. 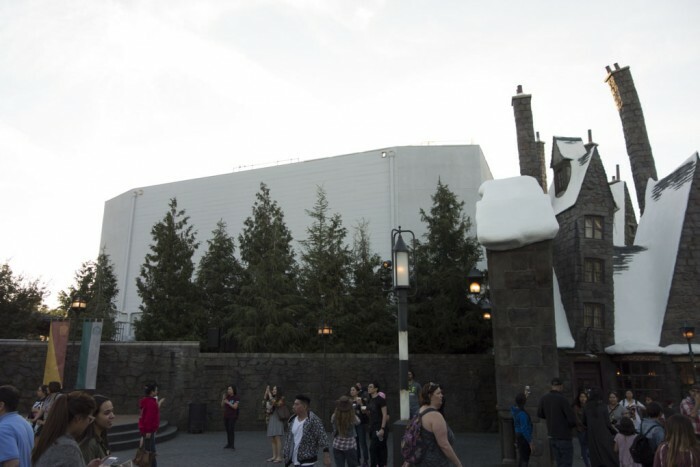 When you’re ready to enter the stand-by queue for Forbidden Journey you’ll probably be directed to enter its massive outdoor extended queue. 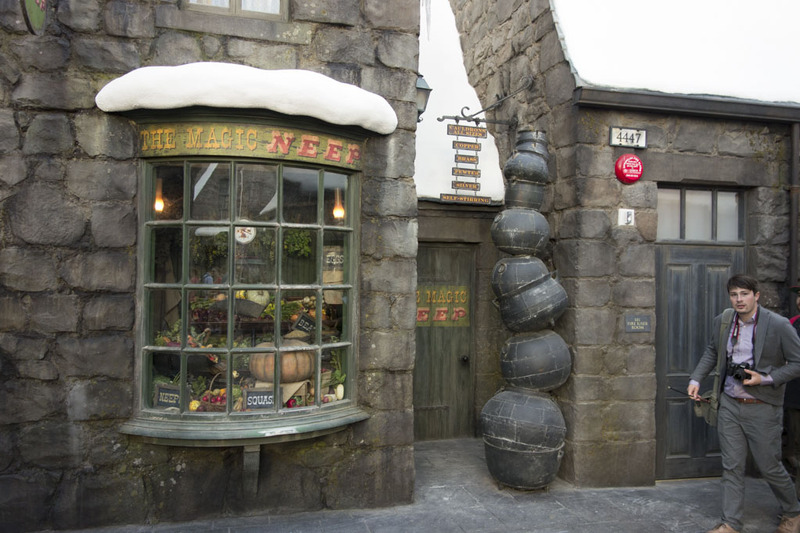 This section of the queue is outside and to the left of the castle and is very long and winding. There are some fans to provide relief from the heat, but other than that is is uncovered and there is very little shade. The temperature today was in the low 80s, which was bearable, but during the summer it will be brutal. 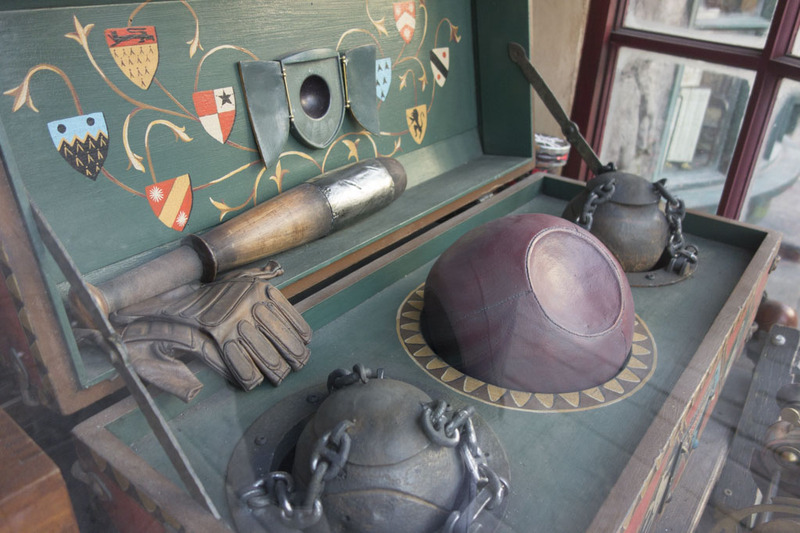 Pictured above is one of the few items (besides the castle) to look at while you’re waiting outside. 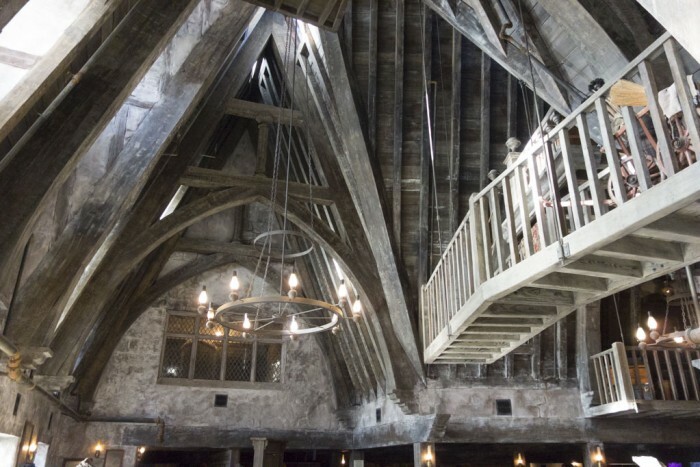 Eventually you’ll get inside Hogwarts and you’ll be able to enjoy the air conditioning, and nice things to look at. Harry Potter and the Forbidden Journey is a dark ride/thrill ride that mixes large scale projections (similar to Soarin’ Over California at Disney California Adventure) and huge psychical sets to take you in and around Hogwarts castle. 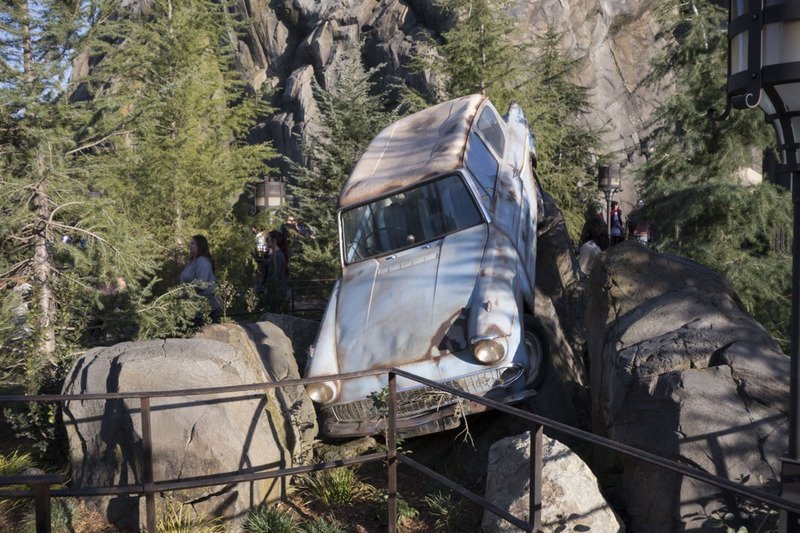 During the ride you’ll narrowly evade an attacking dragon, spar with the Whomping Willow, get tossed into a Quidditch match, and fight off Dementors. The feeling you get when you ride Forbidden Journey is one-of-a-kind and something that you need to experience for yourself. 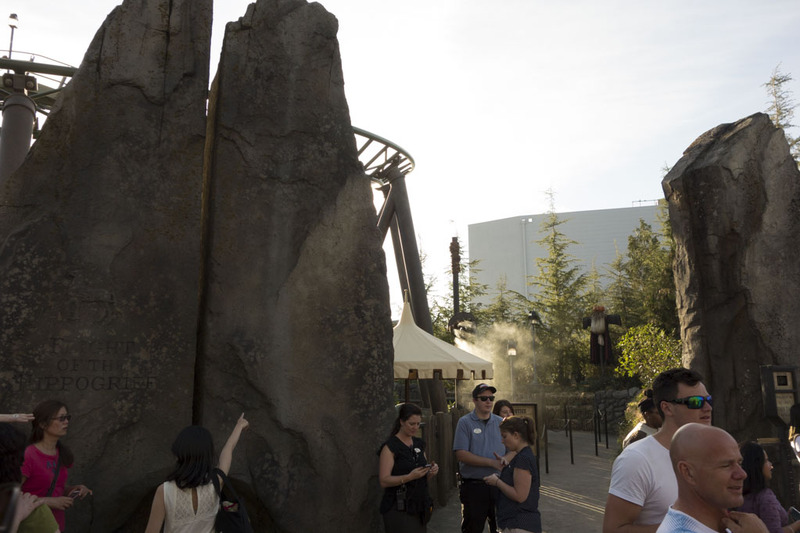 Your bench, yes the ride vehicle is a bench, moves in every direction and feels remarkably like free flight. There are a couple of differences from the version of the ride at Islands of Adventure in Orlando, Florida. 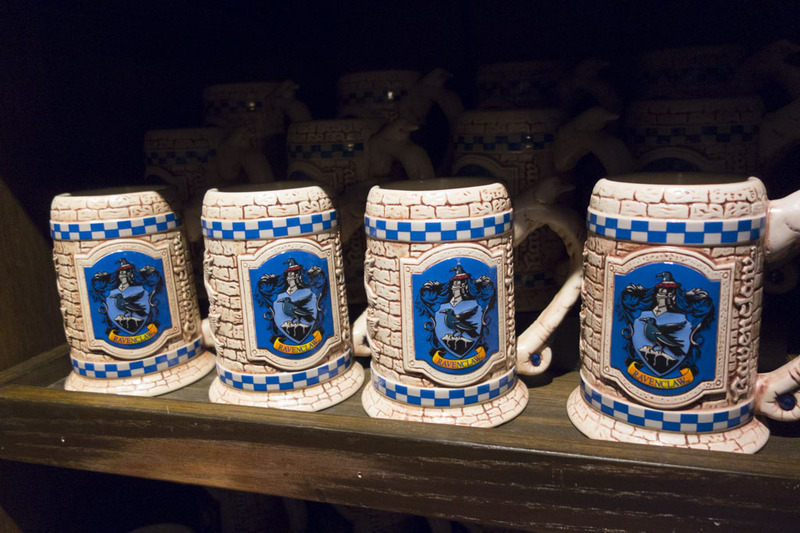 Number one, the motion of the ride vehicles are noticeably smoother. 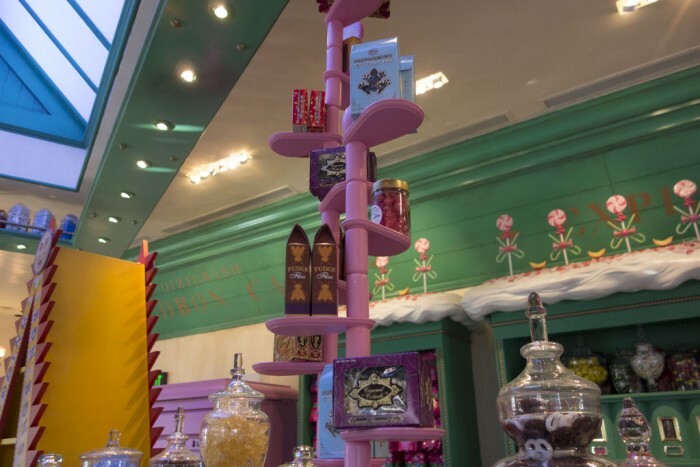 I found the Hollywood Forbid Journey less jerky than it’s Orlando counterpart. 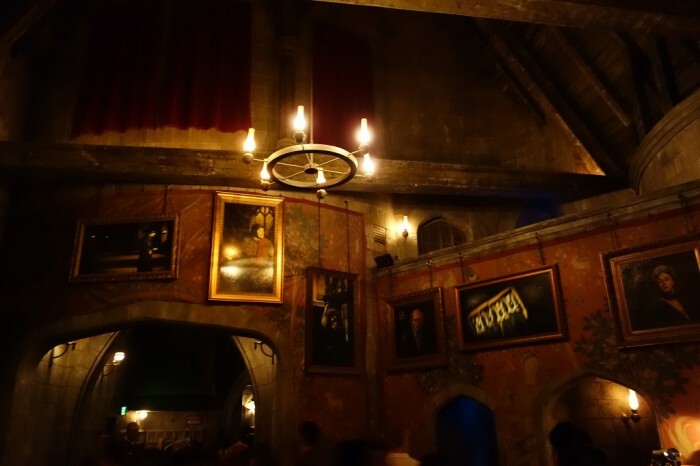 Since Forbidden Journey has opened in Florida we have heard from a number of our readers that Forbidden Journey makes them feel nauseous. 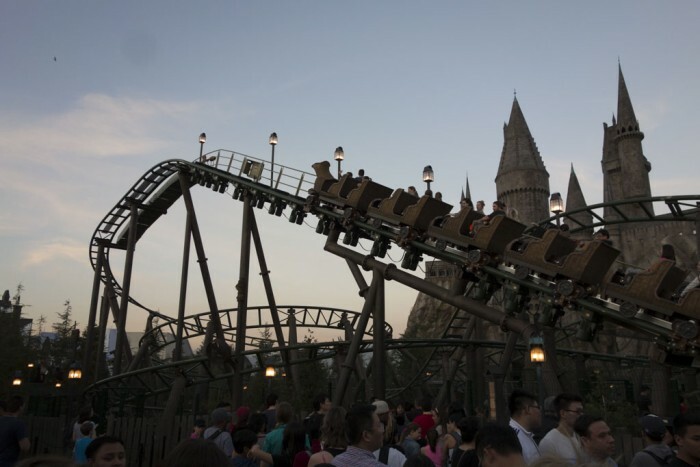 Unfortunately while the Hollywood version is smoother, it is still very much an intense thrill ride that I imagine many people will have a problem riding. Number two, for some reason Universal decided to make Hollywood’s Forbidden Journey 3D, which means you’ll have to wear 3D glasses on the ride. I do not think 3D made Forbidden Journey worse, but it my opinion it adds nothing to the ride. A minor nitpick: I wear glasses, therefore when I ride attractions that require 3D glasses I need to then wear 2 pairs of glasses. 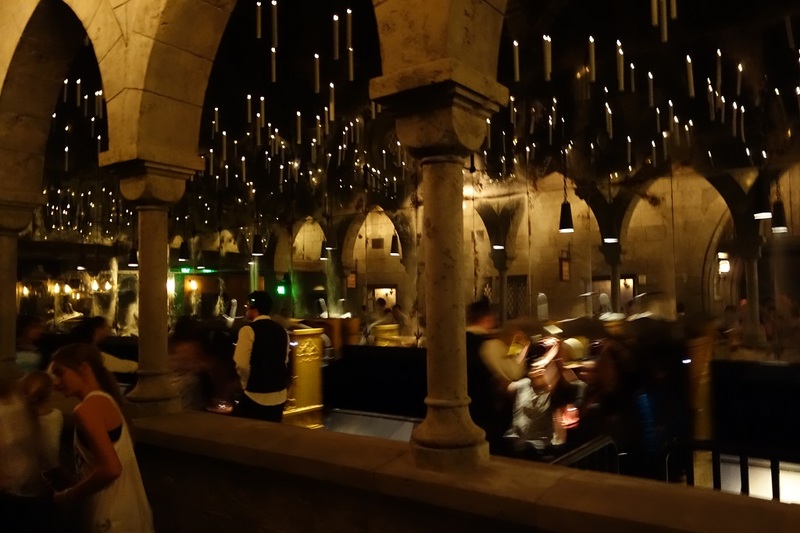 For some reason Forbidden Journey’s glasses fit poorly on me. 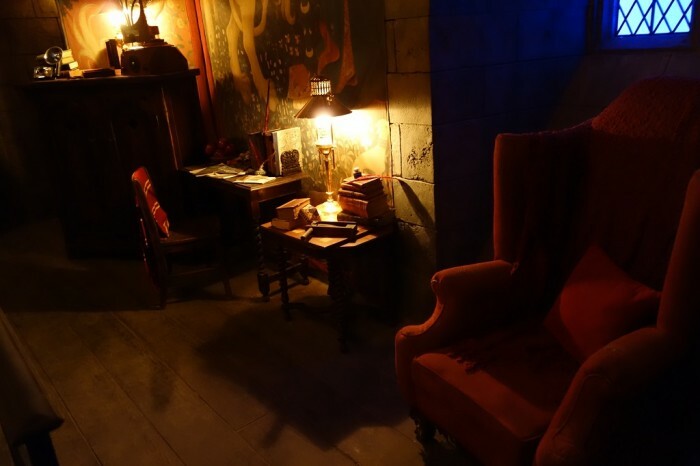 They sit far from my face, making it feel like I’m watching the ride through two little boxes, and I had the constant feeling that they were going to fly off during the ride. Hogwarts looks especially good at night. 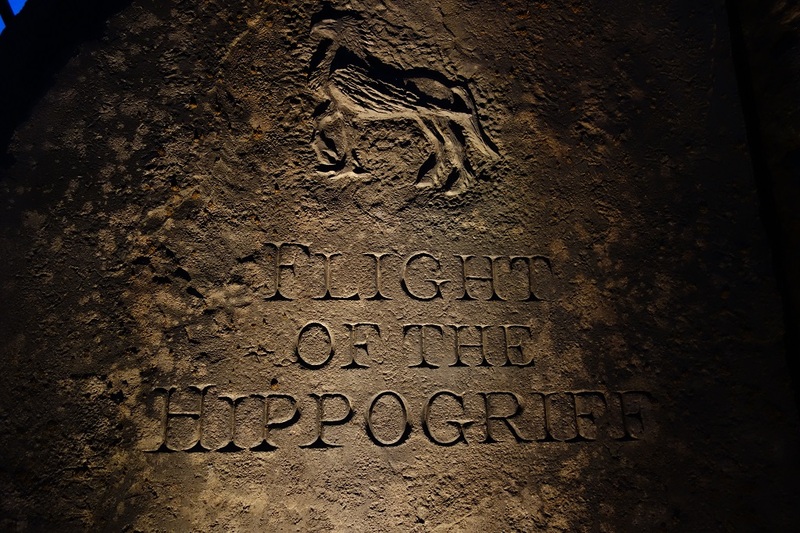 Flight of the Hippogriff is a kiddie coaster located to the right of Hogwarts castle. 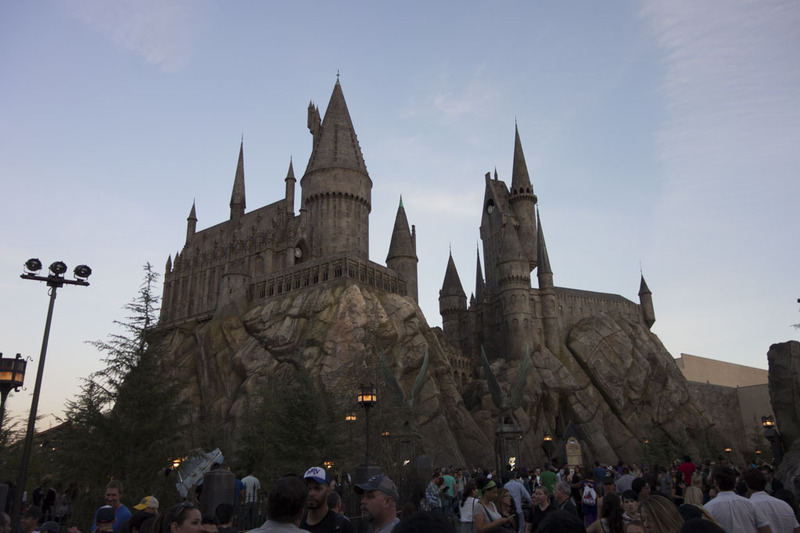 The total ride time is very short (less than 1 minute) but you are treated to some nice views of Hogwarts while you’re on the lift hill. This is a good beginners coaster for small children. I wouldn’t recommend waiting more than 20 minutes for this ride. 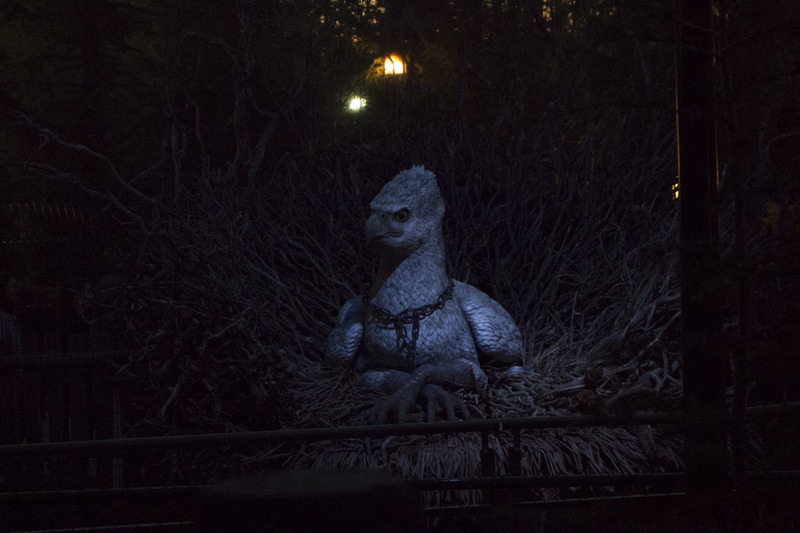 The highlight of Flight of the Hippogriff is a brief encounter with an animatronic hippogriff. 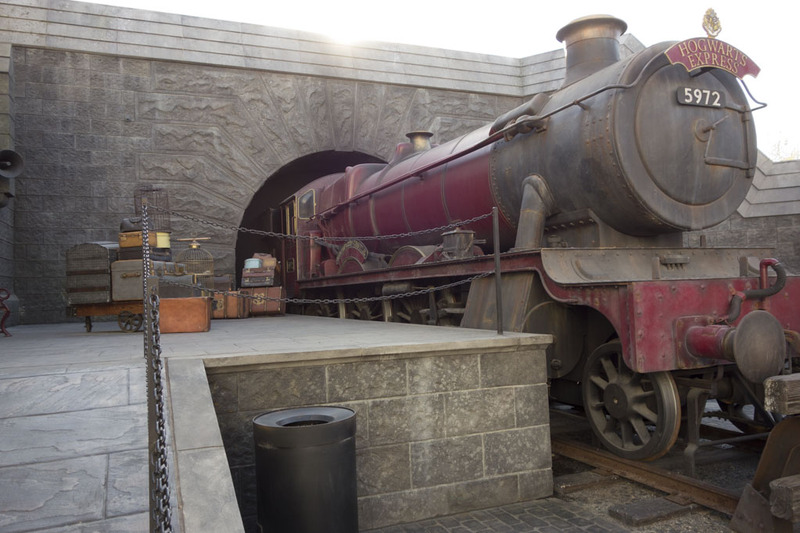 Exclusive to WWoHP at Universal Studios Hollywood is this Hogwarts Express photo op. 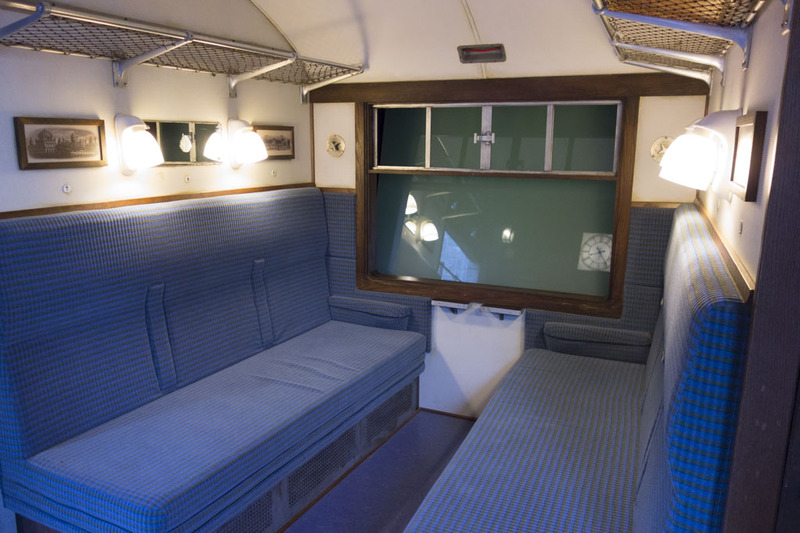 Groups can sit inside a section of the train and take a picture and then purchase it. The cost is $24.95 for a physical copy, or $5.00 for a digital download. The window inside the cabin is green screen so the group can decide on what they want to appear on it. 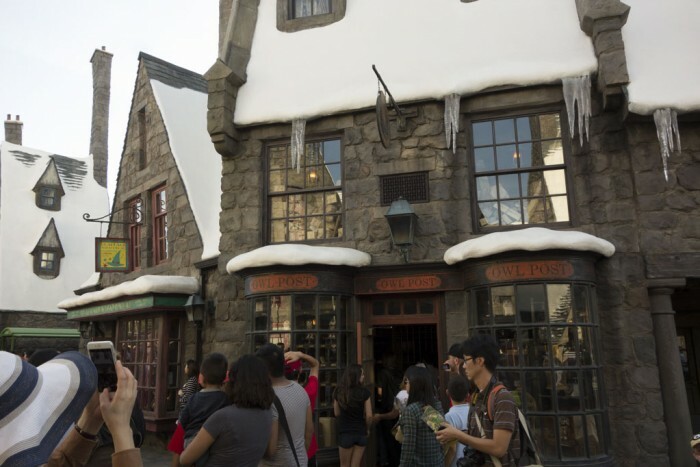 Note that you can not use your own camera at this photo op, you must purchase a picture from Universal. 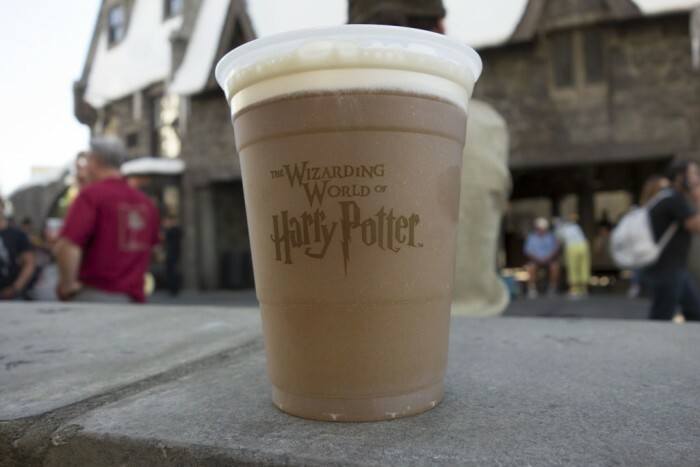 Butterbeer, which has become a phenomenon in the Orlando and Osaka parks, has finally made its way to the west coast. 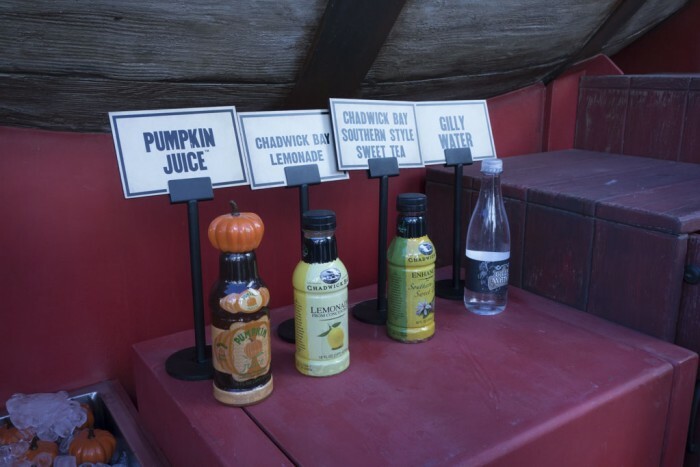 The drink is is a nonalcoholic, cream soda–like beverage served from a tap, with a butterscotch-y head that’s added after the drink is poured. 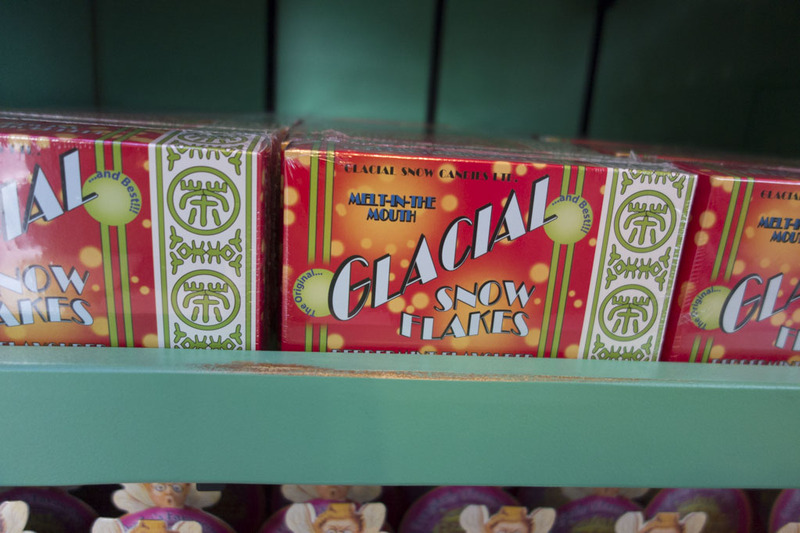 There’s also a frozen version that’s sort of like a slushie, which is my preferred version of the drink. I’m a huge fan. 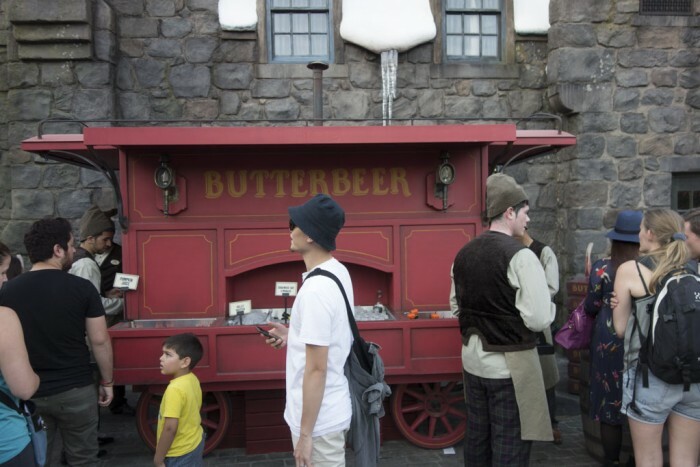 There are two carts serving Butterbeer, each with two cash registers and a small army of employees to take orders. Even with a line of about 30 people I was able to obtain my drink in less than 10 minutes. Other drinks from the Harry Potter universe are also sold at the Butterbeer carts. Three Broomsticks is the main dining establishment in WWoHP. 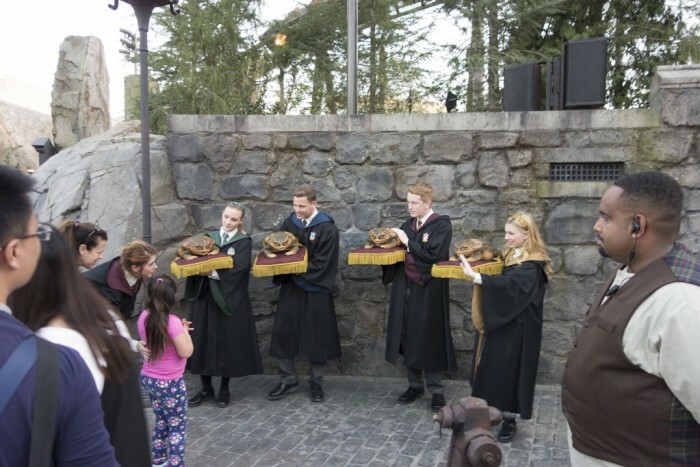 The menu includes English staples such as fish and chips, shepherd’s pie, Cornish pasties, and turkey legs. There’s a large area set aside for a queue, and if it’s anything like Orlando and Osaka waits may reach over 30 minutes on busy days. 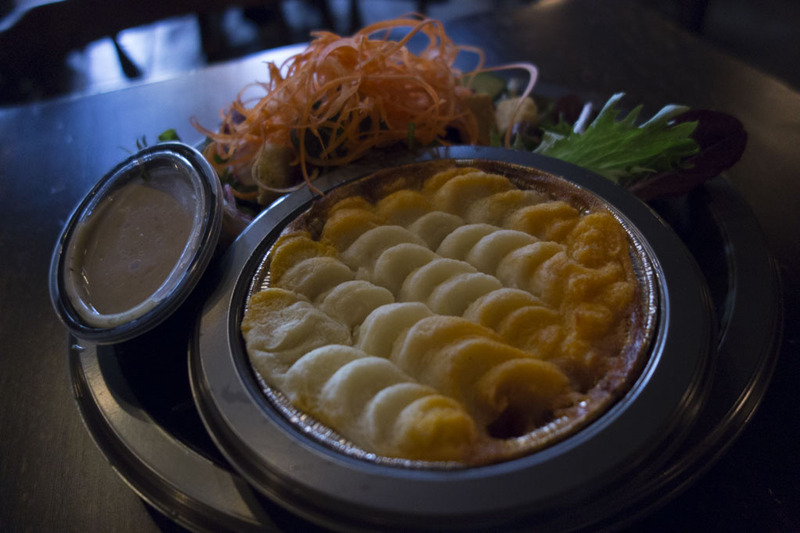 I ate the shepherd’s pie, which I enjoyed. The mash potatoes on top were fluffy, and the meat underneath was flavorful. It’s a perfect hearty meal for a day of touring a theme park. I also ate the Beef Lamb bread bowl which was also very good. As far as desserts go, the Butterbeed Potted Cream is a must try. I don’t know what potted cream is, but I assume it’s concentrated deliciousness and happiness that is mixed together and served in a glass bowl. 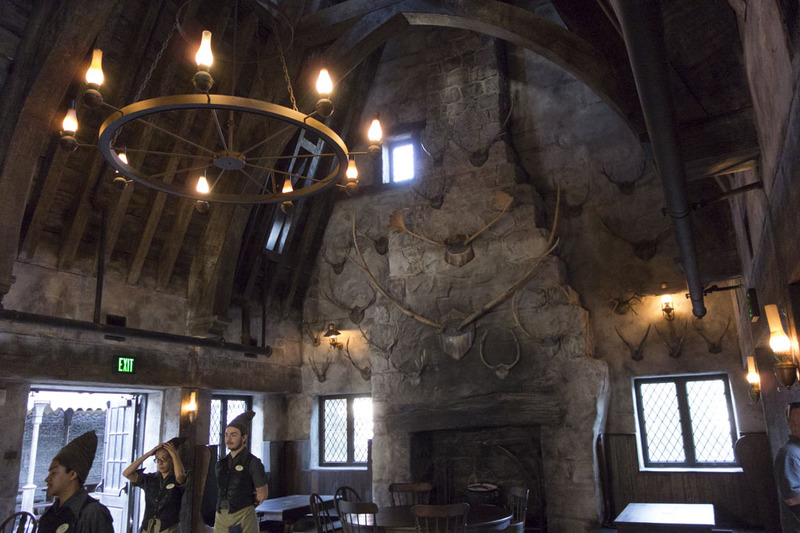 With the exception of the Simpsons-themed food items, Universal Studios Hollywood dining options range from bad to inedible, so by default Three Broomsticks is the best food option in the entire park. 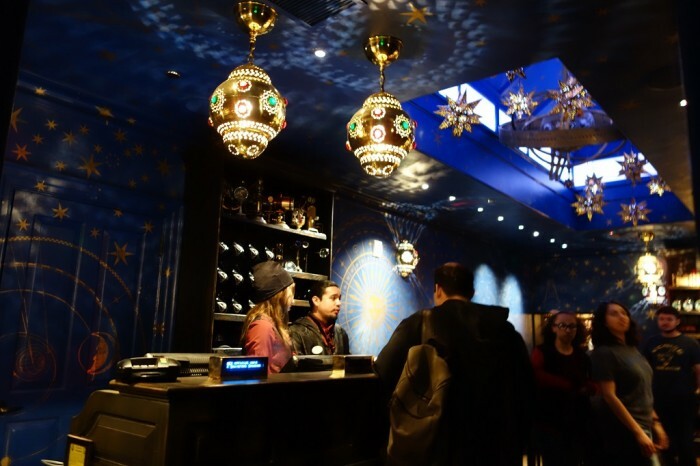 This is Indoor seating is fairly limited, but there is also a huge outdoor seating area. 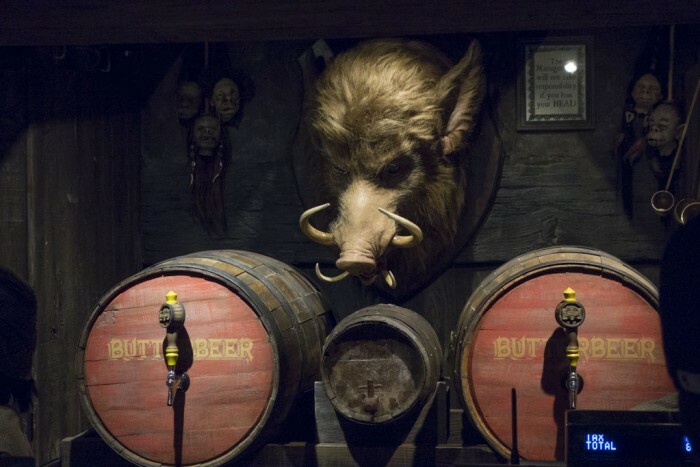 To the rear of Three Broomsticks is Hog’s Head pub, which serves a nice selection of beer as well as The Wizarding World’s signature nonalcoholic brew, Butterbeer. Universal has graciously provided plenty of opportunities to spend money at The Wizarding World of Harry Potter. 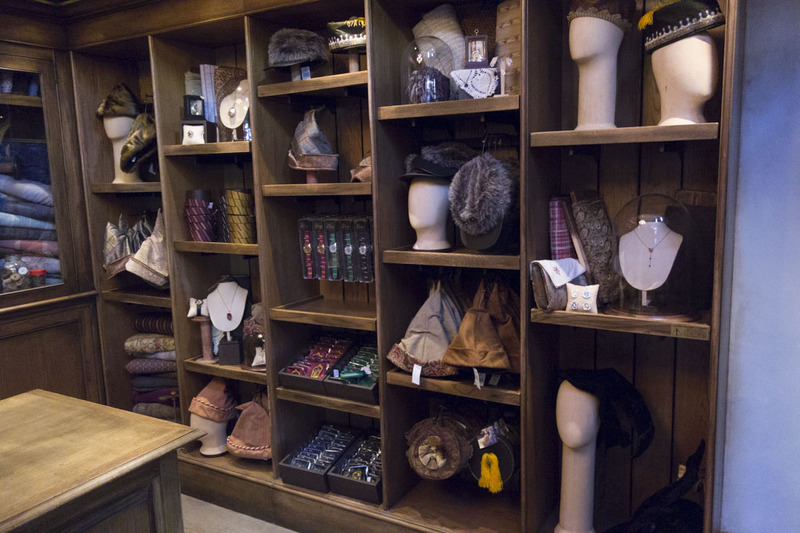 Dozens of different items in a wide range of prices and styles are available in each of the land’s shops. But even if you come to the park with zero money to spend on souvenirs the shops are very much worth spending time to explore. 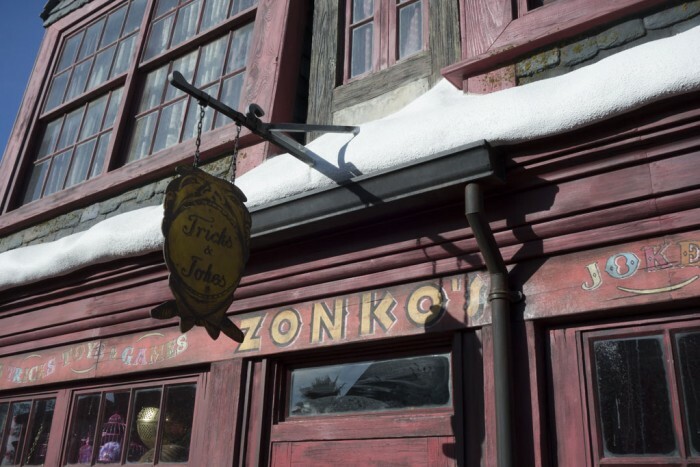 The first set of stores you’ll see after you enter the land are Zonko’s Joke Shop and Honeydukes, both of which are connected to each other. Zonko’s is a very small section of the store and in it they sell novelties like a tin “Duck on a Bike” toy, or a “Egg and Spoon Race” game. 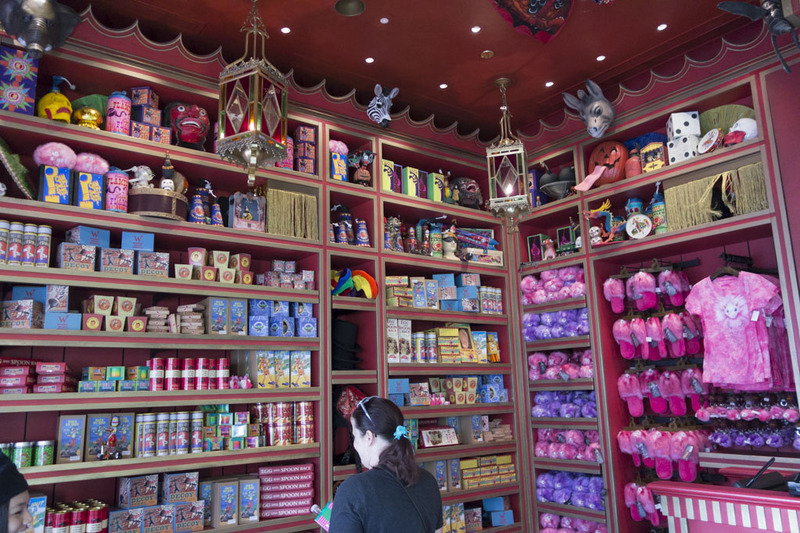 Credit must be given to Universal for stocking this store with unusual items that are theme-appropriate and are interesting to look at, even though most guests probably won’t want to buy them. 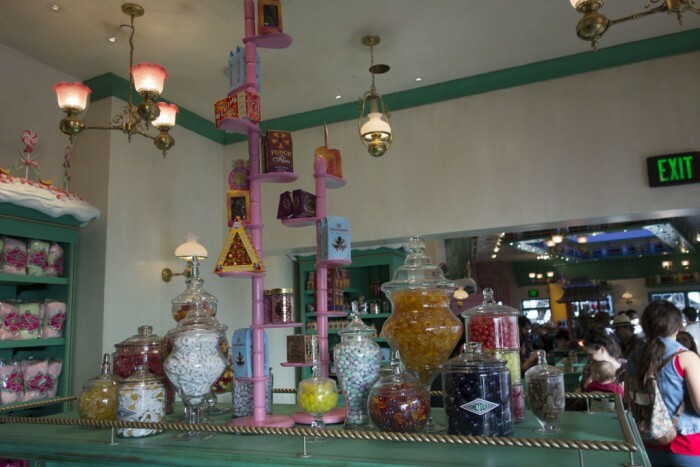 Honeydukes is a candy store that takes up a large portion of this building. 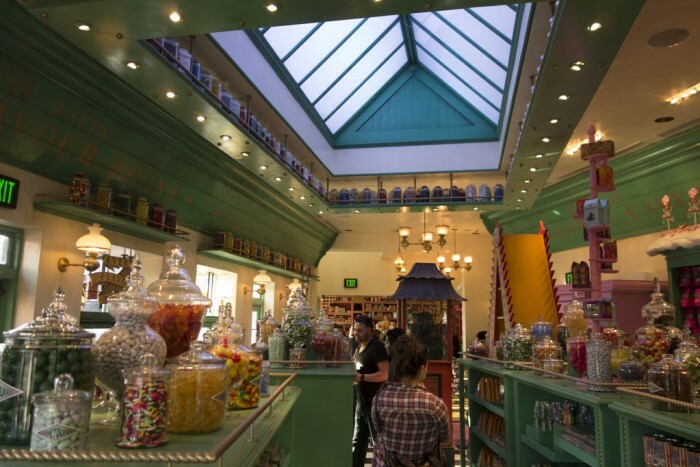 In it you’ll find edible treats from the Potter universe like Bertie Bott’s Every Flavour Beans, Honeydukes Mice Pops, Cauldron Cake, and many other items of that nature. 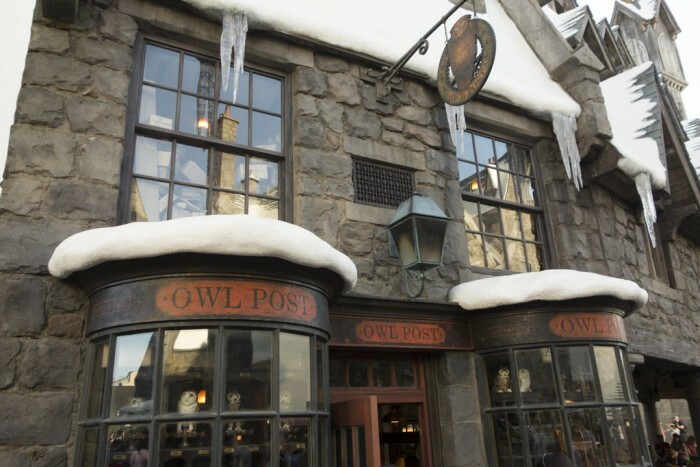 Further down and across the street is Owlery, Owl’s Post, and Gladrags Wizardwear. These three store fronts have different facades on the outside, but are pretty much one shop with four rooms on the inside. 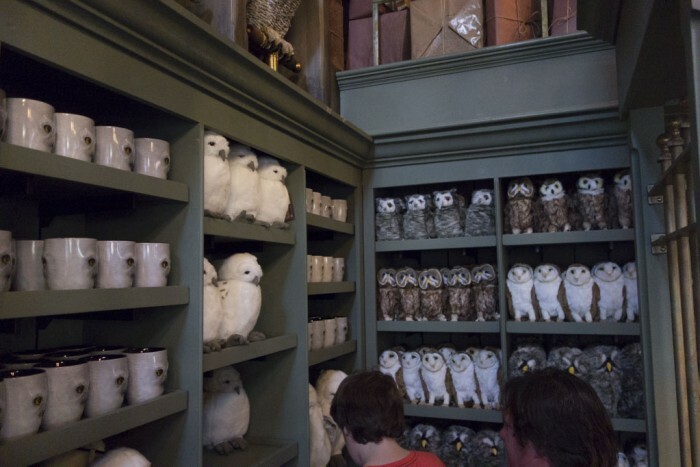 I especially enjoyed the Owlery room which featured several owls on perches that move and hoot. 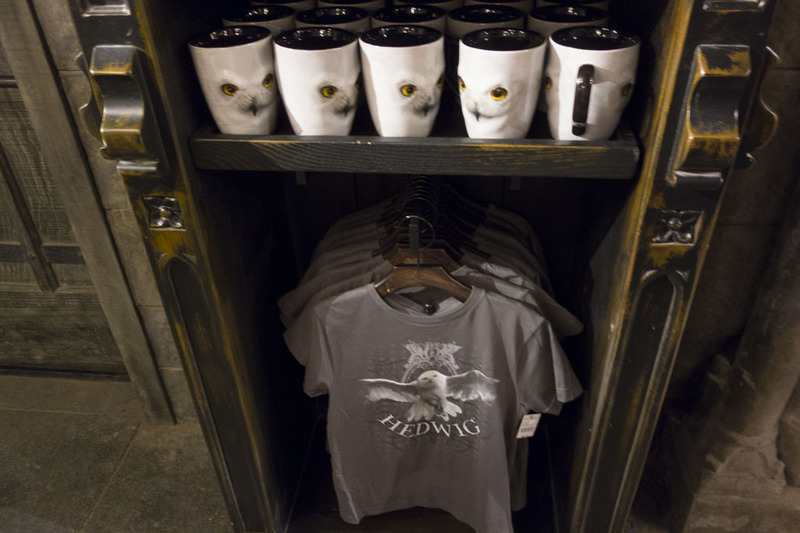 The owl poop underneath them has to be some of the most realistic poop ever rendered in a theme park. 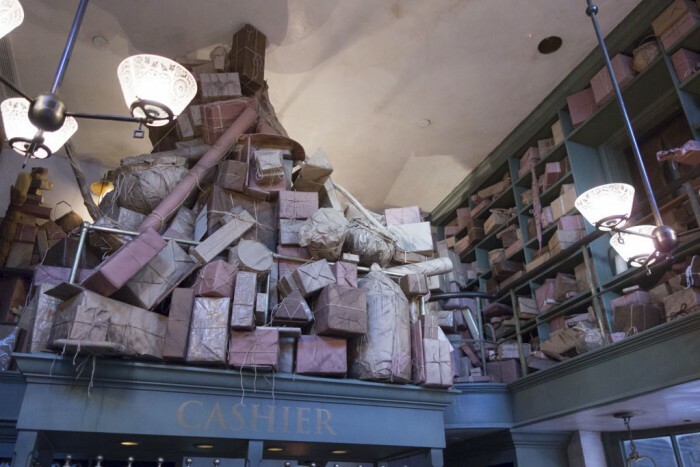 Across from Gladrags is Ollivanders, which is half-shop-half-attraction. Here you can take part in an interactive experience where a Wandkeeper presents a wand and invites you to try out a spell. Your attempted spells produce unintended, unwanted, and highly amusing consequences. Ultimately, a wand chooses you, with all the attendant special effects. This experience is the second most popular attraction in the previous two WWoHP locations, so they took no chances this time. Behind the shop is a large queue for people waiting to enter, which fits less than 30 people at a time. The line to enter Ollivanders was 30 minutes, even during the technical rehearsal I attended where attendance was capped at a few thousand people overall. 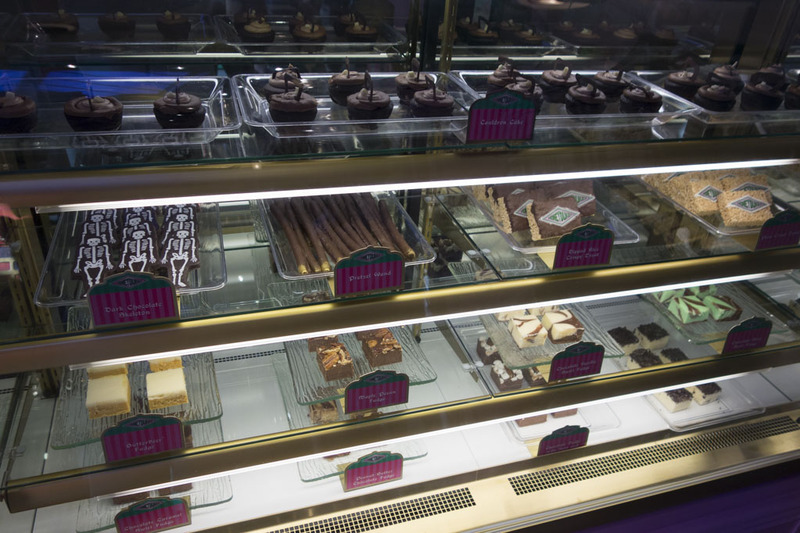 We expect the wait to be much longer when after the land opens in April. Naturally, riders of Forbidden Journey exit directly in to a large gift shop, called Filch’s Emporium. 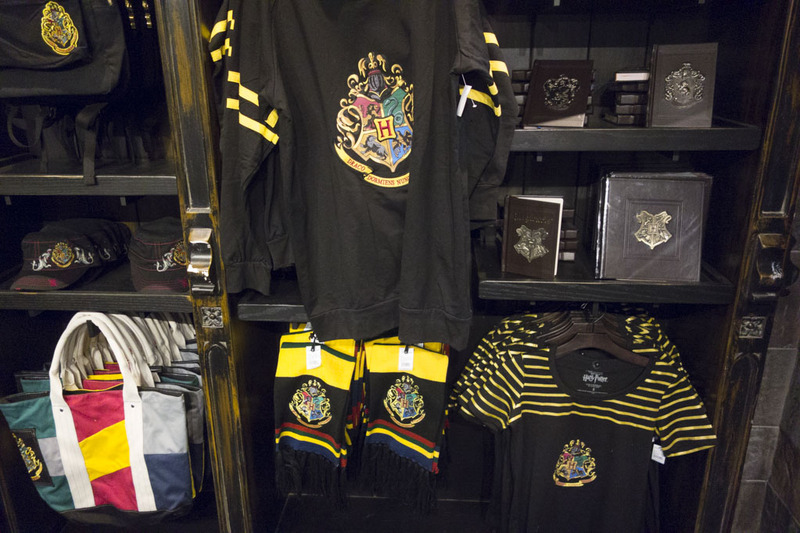 Something I noticed was the unusually high quality for some of the items being sold. This isn’t your normal cheaply made theme park ware. My biggest complaint about the Hollywood Wizarding World is how often the real world and other parts of the park can be seen from inside the land. These are not things you need to look very hard to find, no telephoto lens is required, nor do you need to peek through some bushes to see them. Huge unthemed show buildings, hotels, parts of City Walk, and the neighboring Water World stunt show can easily been seen from all parts of the land. 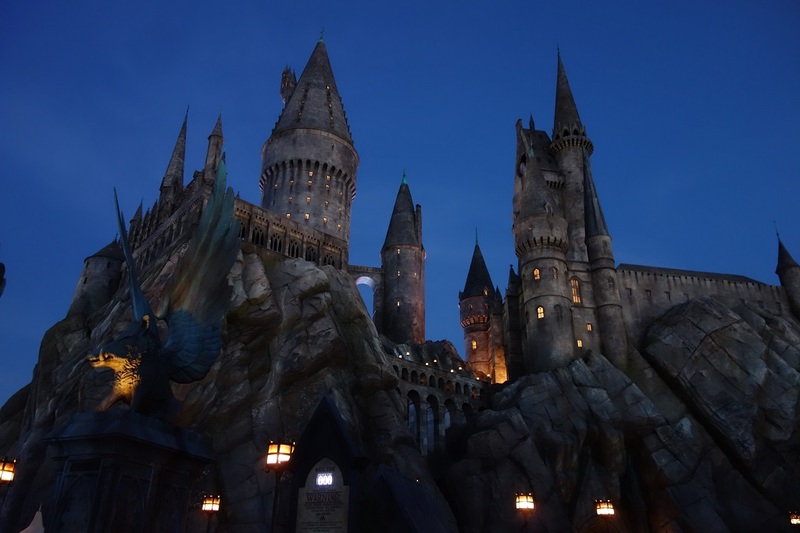 Compare any of the pictures in this post to this one I took of Hogwarts in Universal Studios Japan. I understand that this is a Universal Studios is a very small park with very little room, but would it have been impossible to hide the giant flat walls? This giant building is home to Shrek 4D. Clearly visible from inside WWoHP. Obviously seeing some walls will not ruin anyone’s day, but it’s so glaringly obvious that I had to bring it up. The Wizarding World of Harry Potter is a beautifully executed land that is a joy to experience. 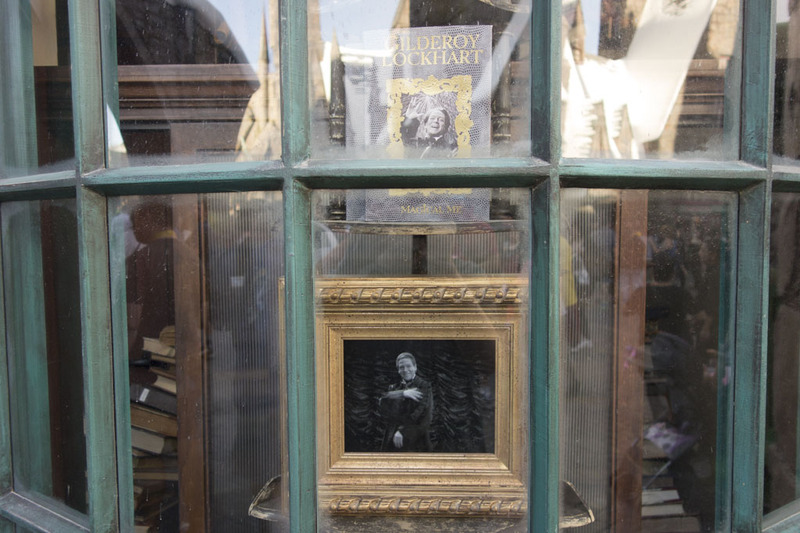 Potter fan or not, you need to see it. 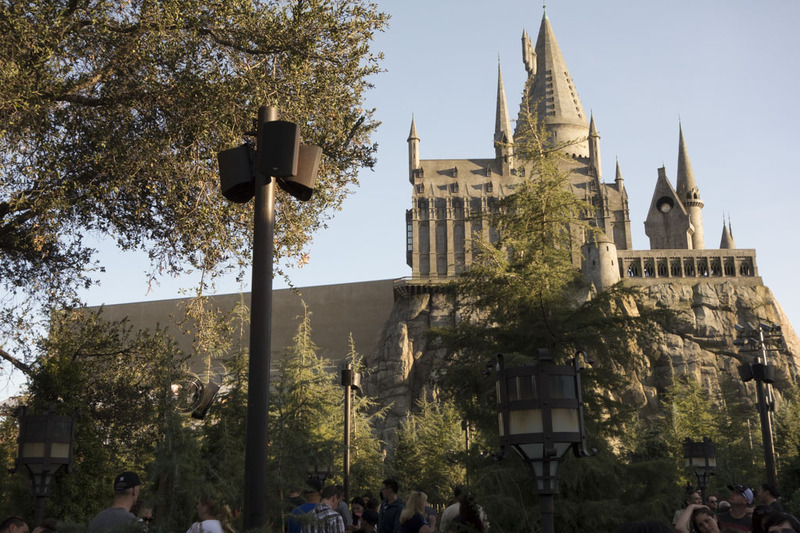 Universal Studios Hollywood still has a long way to go before it can compete with Disneyland in terms of both quality and quantity, but Potter and the other recent additions (like Springfield and Transformers) are a good start. Keep in mind that even with the two new Potter attractions the park still only has 8 rides, and 4 shows. For me personally, that makes a $90 ticket a hard pill to swallow. 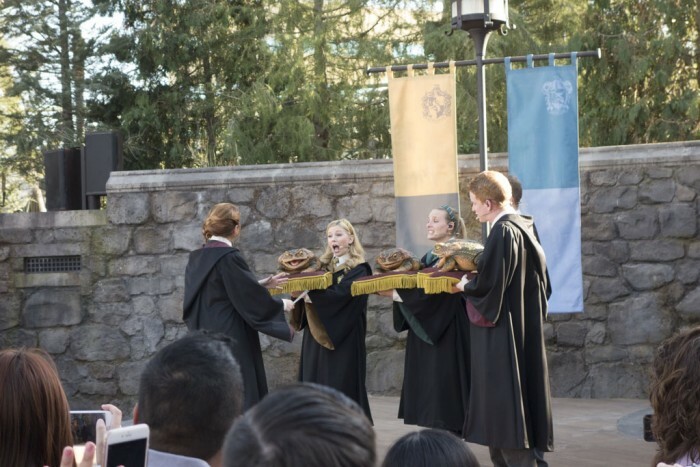 Should you visit Universal Studios Hollywood to see The Wizarding World of Harry Potter? Yes. 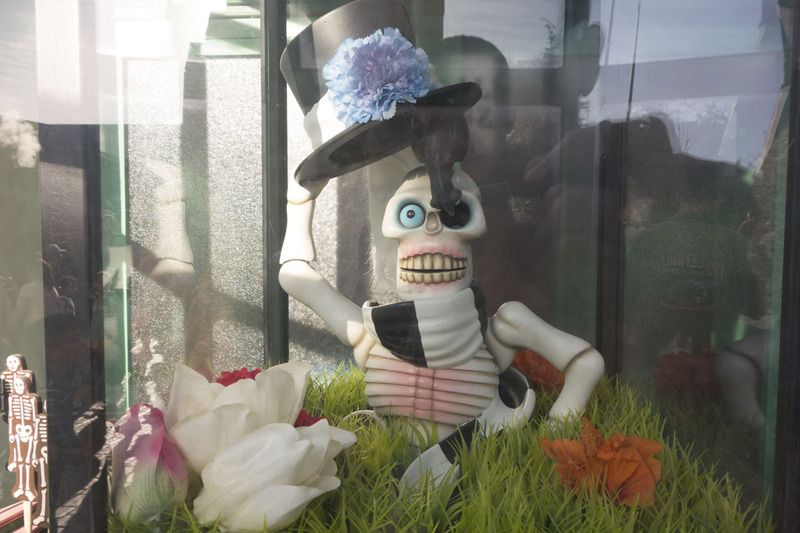 Should you shorten your Disneyland trip by one day and make the 35 mile drive that will be filled with nightmarish traffic? Yes. But expect to wait in some long lines when you get there. 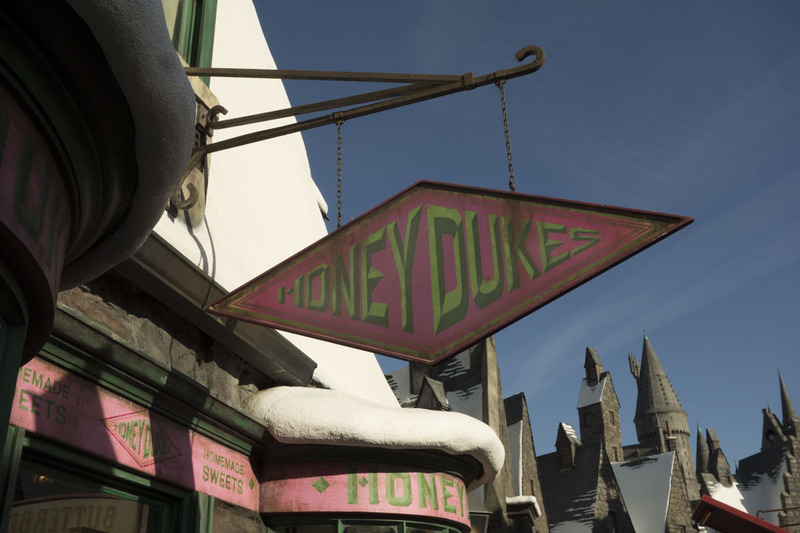 Hopefully Shrek 4-D will be demolished relatively soon and open up some room for a small expansion of Hogsmeade, but yes a little disappointing but not mad at them. 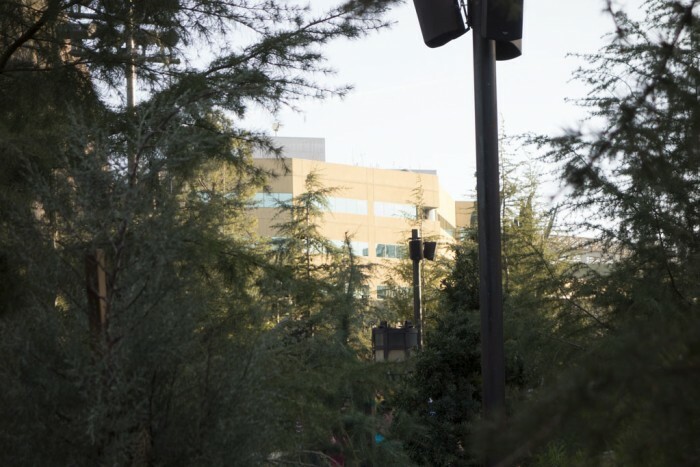 Hopefully Universal will listen and add some big trees blocking the view of the offices before the grand opening in around 2 months. 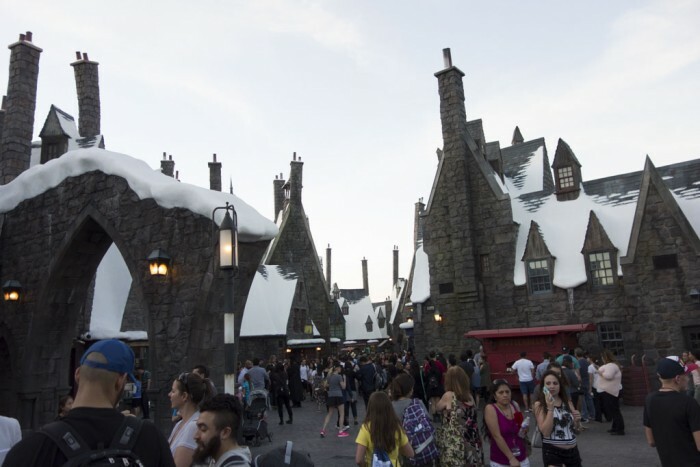 But we can’t be too spoiled, would you have the Gipson Amphitheater or Hogsmeade. You nailed it, it’s hard to complain too much about the sight lines when it will have little to no effect on how much the average person enjoys the land. Plus eventually the trees will grow and help with the problem. Ironically, I live just a few miles away, but haven’t been here in ages, even though I go to Universal Orlando every 2-3 years. 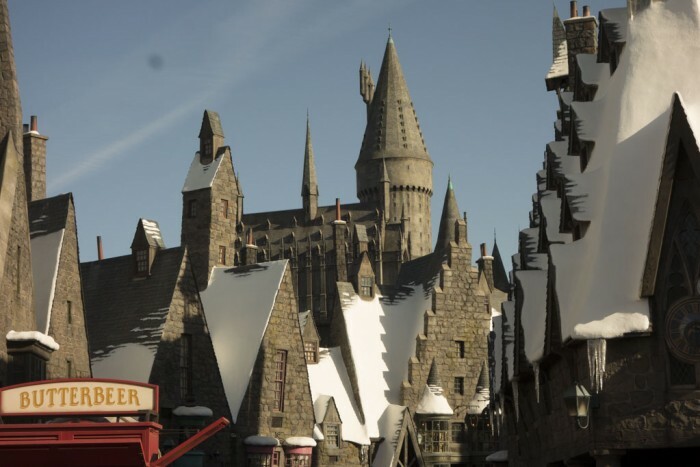 There’s not much difference in the Harry Potter land but I did enjoy Springfield. 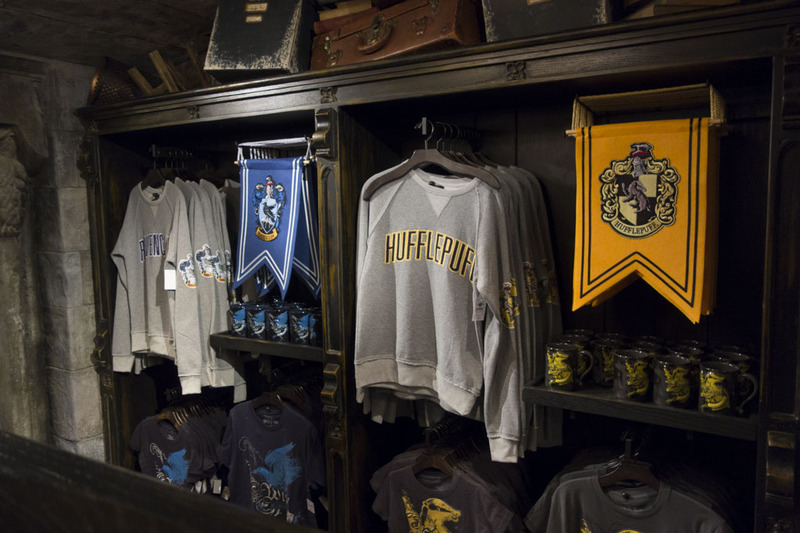 Also the Studio Tour is still a big draw for me personally. 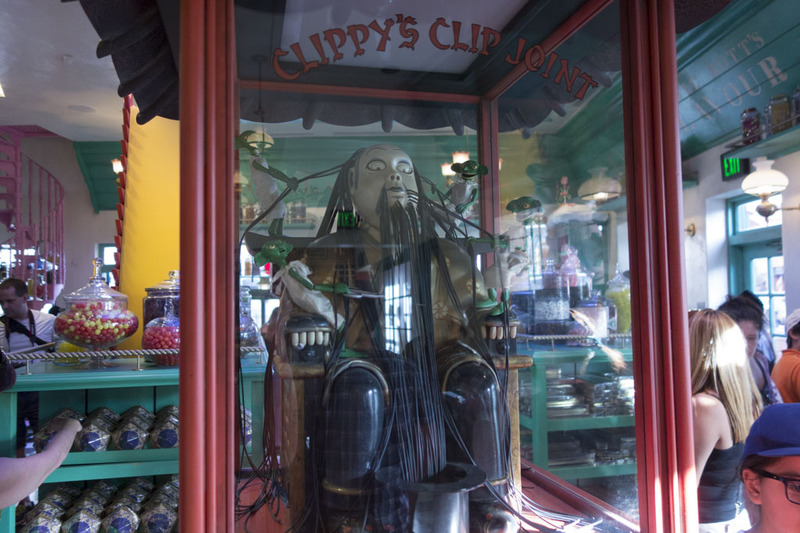 Looks like a clone of what I have been visiting for 6 years in Orlando. 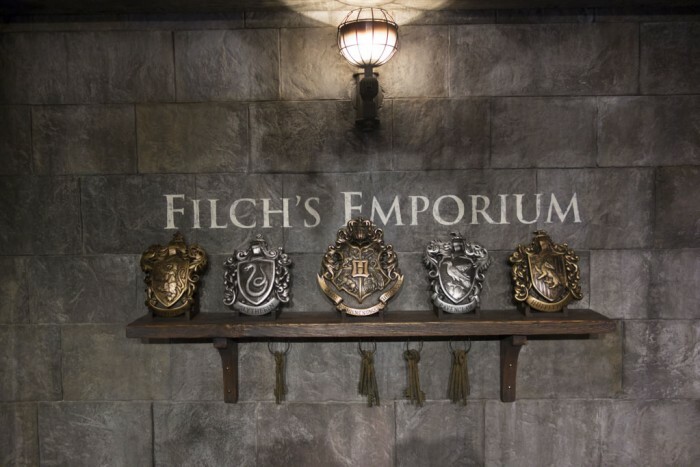 What a shame they didn’t build some other element of the HP universe. 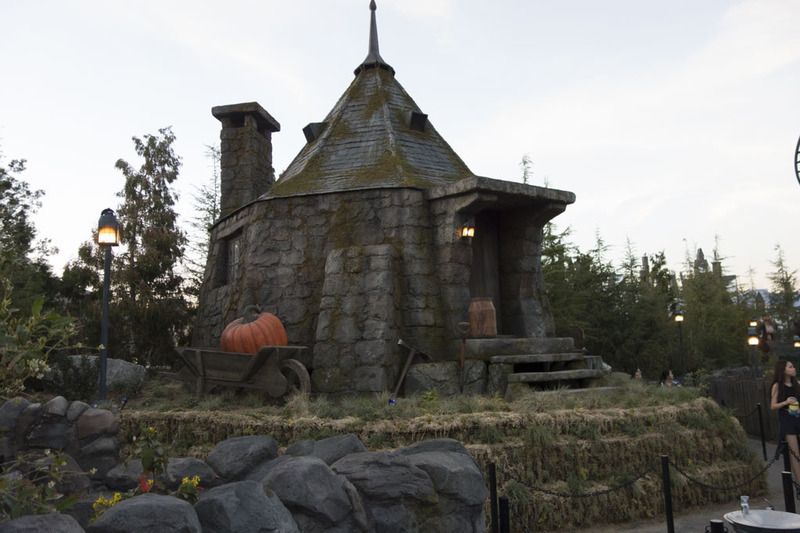 I think it’s a safe bet that USH is going to add more Potter to the park in the years to come.